German “hyperpolyglot” Judith Meyer and other well-serious language learners were inspired to organise the “Polyglot Gathering” (Berlin, 15-18 June 2014) by their experience of the Polyglot Conference in Budapest in May 2013. I only found out about the 2013 Conference late in the day and was unable to attend, so I made darn sure to sign up in good time to the Gathering and spent several months in eager anticipation. As mid June approached, I was still enthusiastic, but also a little nervous. This was less because I had volunteered myself as a speaker – I enjoy preparing and delivering talks – but more that I wasn’t sure that as a more-or-less fluent speaker of a mere four foreign languages, I qualified for the title “polyglot”. I did, at least, have my beginner’s experience in several other languages, I told myself. I need not have worried. Attendees ranged from those whose language tally was in double figures to those beginning their first foreign language. “Language Learning Enthusiasts’ Gathering” would maybe have worked better as the title. In this post I share some of my thoughts and impressions. The 231 Gathering participants were mainly “digital natives” in their 20s and 30s and one or two even younger. Quite a few were, ahem, the “wrong side” of forty. I like to think of them (okay, okay, of us) as survivors of the “short-wave radio, compact cassette and language laboratory era”. Google the words later, youngsters! People came mainly from Europe but there was a contingent from Singapore and a number of Brazilians and North Americans. Among the Europeans, there were quite a few Russians (perhaps reflecting Russia’s very strong tradition of linguistics and interest in foreign cultures) and also several Poles. As often happens with events conducted predominantly in English and leveraged off mainly English-language activity on-line, the north Europeans came out in stronger force than the Latins. That said, the Italians and Rumanians were well-represented. There were some French people, but I didn’t meet any Spaniards or Portuguese. There were many “ex-pats”: a Canadian living in Finland, an Italian living in Lithuania, Brazilians living in Germany. A Pole living in Sweden was, at 17, the youngest participant. I spoke Welsh with a woman from Bala (north Wales) working in Italy…. There was Britain’s “most multilingual [now-ex] student”, Alex Rawlings, a week or so out of Oxford and on his way live in Budapest. A star turn was Richard Simcott, Britain’s most multilingual person, full stop. He, it turns out, is based in Macedonia. One of Richard’s key messages was the need to build languages into your daily life if you’re going to maintain them and “ex-pat” living can obviously make this easier. Oh, and I shouldn’t forget the presence of Professor Victor D. Huliganov, the distinguished Russian boffin based in Warsaw. The prof was trying to pass himself off as an ex-pat Englishman with the unlikely name of David James, but fooled nobody 😉 . At the level of personal practice, I was very pleased to speak a lot of Russian (and not just with Russians), much more French than I expected, rather less German (but there was chance to practise out and about). Even some of my very bad Portuguese and rusty basic Hungarian and (even more) basic and (even more) rusty Finnish cranked into action. My own talk was about minority languages, with a focus on Welsh. I quickly established that my message would come under the scrutiny of several other fluent learners. David James and Richard Simcott have both learned Welsh to a very high level. The same is true of another doyen of online Polygottery, Simon Ager of Omniglot. There was also an upper-intermediate learner making good progress in classes in Basingstoke (English west midlands). The Celtic languages as a group were well represented. A show of hands showed during my talk identified a number of Irish speakers (all learners, I think). Simon knows Manx and has even written a song in it – see below. I didn’t come across any Bretons. If they had been there, their love of music and dance would have given them away. A sense of the full tally of languages represented can be had from one evening’s quiz when the word “bird” was translated into more than fifty languages (not without some dispute among the rival teams about whether certain offerings were mere “dialects”). I couldn’t remember the Basque word for bird when I needed it (txori – now seared in my memory) but neither could anybody else. I did not meet any fellow-Basque learners, which was something of a surprise, given its linguistic uniqueness. Next time, maybe. Learners of the “big” languages were, of course, very much in evidence. Chinese continues its advance. Indonesian seems to have its share of devotees. Many polyglots are also interested in constructed languages or “conlangs”. There were two sessions on the minimal langauge “toki pona” one led by its creator. On the subject of conlangs, a bonus of the Gathering was an indirect glimpse into the world of Esperanto. Judith Meyer and Martin Sawitzki (another of the organisers) are long-standing active members of the Esperanto movement. I suppose that the overlap between Esperantists and Polyglots should not come as a surprise. Many people who appreciate foreign cultures may be all the more open to the internationalist aspirations of the Esperanto movement. 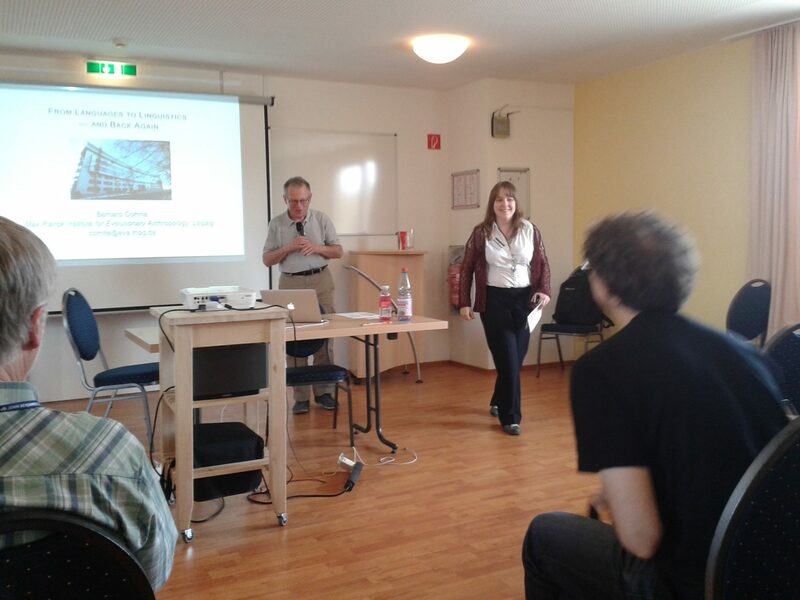 Judith and Martin borrowed features of Esperanto conferences at the Gathering. The aligatorejo was a language practice session (where you have to speak in any language but the dominant one of the environment (so no Esperanto at Esperanto meetings, no English at the Polyglot Gathering) or your mother tongue. The evening gufujo (literally “owl box”) was a candle-lit room where a wide selection of teas was on offer with the multilingual conversation; a calmer alternative to a visit to the bar. But for a programme clash, I would definitely have been at Gavan Fantom’s talk “Being raised as a native Esperanto speaker”. Benny Lewis has argued that learning Esperanto can be a good place for newbie language learners to start. It provides a relatively easy initiation into the learning process and, if you stick at it, it can give you an thrill of success and an appetite for more. Benny’s girlfriend Loren was one of the ones who gave a 5-minute “Six-week challenge talks” (for speakers who had not studied more than five hours of Esperanto before 1st May 2014) and she’s now learning Russian. World Polyglottery: the power of the internet and the end of the gatekeepers? 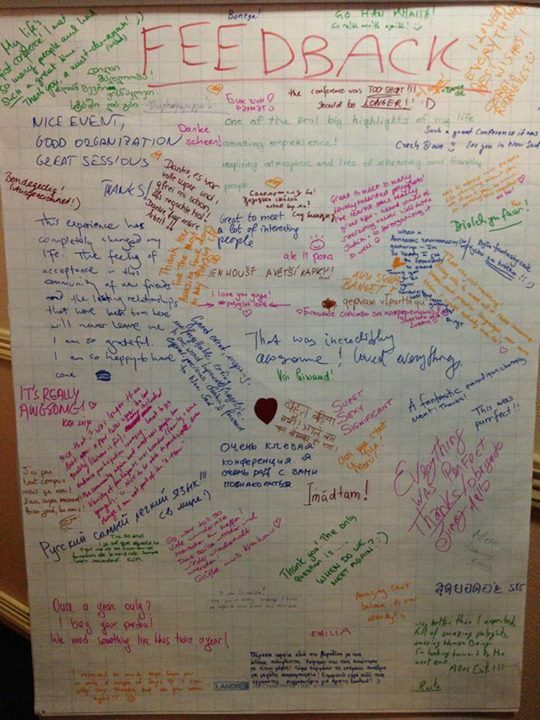 During the Gathering, I heard many references to “this community”. Let’s call it World Polyglottery. Most of us had found each other on-line. A couple of decades ago, making these contacts and arranging this event would have been much more difficult. Think ads in specialist magazines, typed flyers cranked out on ink-roll duplicators, payment sent by snail mail, multiple telephone calls. Thank goodness for the internet (and cheap air travel)! On the programme was a wide range of speakers of varying degrees of expertise. The organisers were taking a punt on volunteers, many of whom previously unknown to them. A more established or hierarchical event might have weeded out or two of the more flakey presentations in advance but I’ve sat through some dire stuff at more formal academic conferences in my time and I really liked the get up and have a go atmosphere and absence of professional “gatekeepers”. An intelligent public is more than capable of evaluating for itself. Most speakers were well-prepared and obviously sharing their passions. The whole spirit of the event was “bottom up” and time was scheduled for “lightening talks”, more or less spontaneous five-minute talks on any subject about which the speaker was enthusiastic. The attendees were nothing if not a bright bunch. I would hazard that most were either university students or graduates. The polyglot careers of some sprang from the base of university studies in languages but far from all participants focussed on languages in their higher education. In his talk, Alex Rawlings considered whether majoring in languages could actually get in the way of learning them. He explained that bulk of the University of Oxford Modern languages course was either formal linguistics or European literary history and criticism. It was just assumed (and expected come the oral exams) that you would somehow acquire a practical command of your chosen tongues. This left students forced to draw on their own resources. It sounded like the experience nearly finished Alex off but, happily, it was a case of “what doesn’t kill you makes you stronger” and he came out convinced of the merits of the approach. I couldn’t help thinking that Alex’ undergrad experience would have been a lot different if he’d studied under Professor Bernard Comrie. His talk was “the real deal” from a lifelong professional linguist and language learner. What accounts for the high level of lexical borrowings into the Haruai language (Papua New Guinea) , his field work made clear, is that Haruai speakers use ordinary nouns such as “mountain” as personal names. They also have a taboo on uttering the name of your cross-cousins or in-laws. As more and more words become taboo, they instead borrow alternatives from the neighbouring Kobon language. Do mathematicians and computer geeks make the best language learners….? I didn’t get to speak to Comrie afterwards, but one lucky participant who did told me that the he had offered the following advice to the next generation of would-be pros: learn statistics, learn to code. Benny Lewis trained as an engineer. Judith Meyer is a computational linguist. Stanislaw Pstrokonski (natural sciences) and Guy Emerson (mathematics, now as post grad in computational linguistics) gave a fascinating talk on a new open-source software package that they themselves are developing to help language learners train their ear to recognise sounds in a target language which learners may find similar (e.g. “sinking” and “thinking” for German learners of English). As a technophobe with no natural bent for numbers, I take of my hat to them all. Does a head for figures or a natural science education help, or is the secret just being generally bright? …..and does it help to be musical….or a mimic? Do the those with a musical bent make better language learners? Some evidence in favour: at the “International Culture Evening” David James gave a heartfelt rendition of the Welsh song Myfanwy. Then came Simon Ager’s playful composition in Manx Spollagyn son Tey/Chips for Tea (about seagulls stealing chips). Torre, from Sweden, composed a hilarious song in English summing up some of the highlights of the Gathering. Coincidence? Maybe. Of one thing there’s no doubt: learning songs in a foreign language is a great way into its spirit and culture. I noticed that Richard Simcott had the gift of mimicry (as he jokingly broke into the voice of someone we were talking with). Several of my friends over the years have been able imitate the voices of famous people or mutual friends. It’s something I can’t get enough of and I love the satirist mimics on television. I’m not saying you can’t learn this, but I’m willing to bet that my mimic friends and Richard are just doing what comes naturally to them. It may be that training in phonology can at least help us to do various generic accents within a given language, even if true mimics are born not made. Musicality, a mimic’s ear: whether gifts or skills, I’m not saying they’re essential for successful language learning but they are certainly up there as very “nice to have”. Polyglot love…..polyglot rivalry? Geeks and the power of passion. Throughout these four Berlin days there was that magical buzz in the air that you would expect when group of people who share the same enthusiasms come together. It was great to meet accomplished online polyglot such as Olly Richards or Conor Clyne whose blogs have been part of my language-learning landscape perhaps for several years. An even greater pleasure was discovering new voices, on-line or not, from whom to learn or take inspiration, such as new bloggers Chris Huff and Daniela Maizner. Ellen Jovin, I discovered, has been blogging for five years about her short, sharp, forays into the linguistic “Worlds and Words of New York“. Ellen commented on her blog that for some participants, coming together with so many like-minded people for the first time must have felt like “coming out”. It’s a powerful comparison. Some people had their competitive side on show. Aside from one or two curmudgeonly or over aggressive questioners (luckily not at my talk), it was all good-natured and mainly channelled into the quiz and games sessions in the evenings. From the choice of venue (with catering), through the pre-gathering communications, the website and printed material, to the programme itself, the Polyglot Gathering was put together in a very professional way. It was all the more impressive in that the organisers had never run something like this on before and given countless hours over many months not to make money, but as a labour of love. This commitment and enthusiasm was repaid as best it could be by the willingness of the rest of us to travel Berlin to play our enthusiastic part once there. Geek-fest or celebration of language learning? A large measure of both, I think. Huge thanks to all involved. Roll on next year’s event!